Performed by Anne Barnhart, flute Accompaniment: Jeff Barnhart, piano This extraordinary Music Minus One collection of ragtime classics, arranged for flute and piano, provides a unique opportunity for flutists of varying technical abilities to explore one of the greatest original American musical forms - ragtime - presented by flute-and-piano duo Anne and Jeff Barnhart, who have given new life to a spectacular collection of time-honored rags, while remaining true to the composers' original intentions and the spirit of the rag genre. This new digital recording includes complete versions of each rag for reference and listening pleasure, followed by accompaniment versions minus the soloist for a performance opportunity that any flutist will love. The newly engraved solo part is presented on luxurious acid-free natural/ivory paper stock. 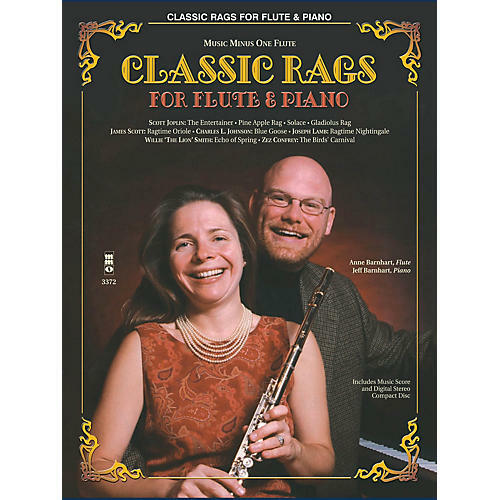 Both professional and student flutists will desire this splendiferous edition containing some of the most sought-after pieces in the ragtime genre, for its lively and authentic performances, sonic clarity and carefully arranged solo part. Presented in MMO's new bound-in book format with beautiful glossy cover, flap-protected compact disc, and fascinating historical notes. Includes a newly engraved, authoritative printed music score for flute with historical notes and performance suggestions printed on high-quality ivory paper; and a compact disc containing a complete version with soloist, in digitally recorded stereo; then a digital stereo version of the piano accompaniment, minus the soloist.